If you are using onion, chop it finely and sauté with olive oil over medium heat (3-4 minutes). Then, stir in julienne cut the carrots and sauté for about 2-3 minutes. 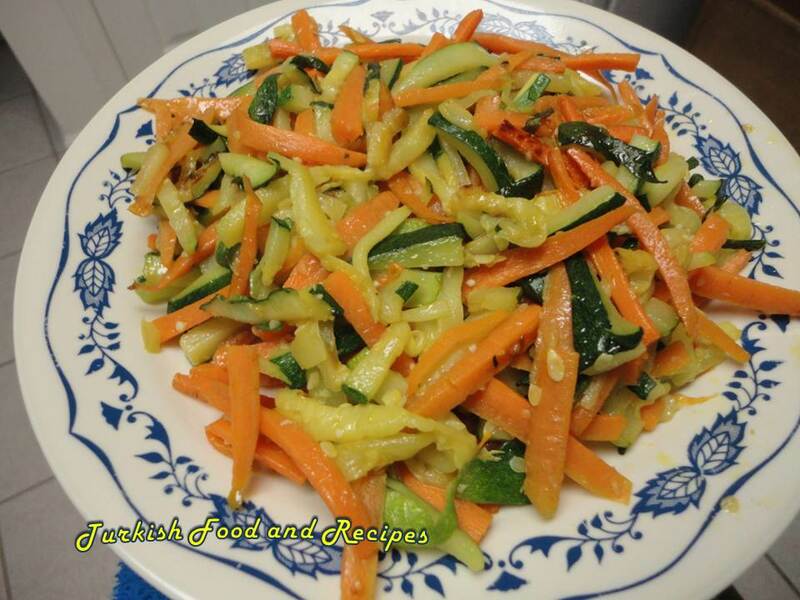 Discard the seeds of the zucchinis and cut them in julienne as well. Add them in the pan and sprinkle with salt. 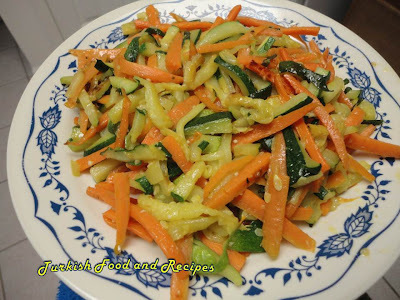 Cook them stirring gently until the vegetables get soft (for about 5-6 minutes). Garnish with dill if desired. Oncelikle eger sogan kullaniyorsaniz sogani ufak ufak dograyin ve zeytinyaginda 3-4 dakika orta ateste cevirin. Daha sonra julyen olarak dogradiginiz havuclari ilave edin ve 2-3 dakika sote edin. Cekirdeklerini aldiginiz kabaklari da julyen olarak dograyin ve tavaya ilave edin. Tuzunu ilave edin. Nazikce karistirarak sebzelerin hepsi yumusayana dek soteleyin (yaklasik 5-6 dakika). Arzu ederseniz uzerini dere otu ile susleyin. This is so simple and healthy.